According to many newspapers the new scale are of up to 54 degrees, but it does not mean as some newspapers write that it has been up to 54 degrees. 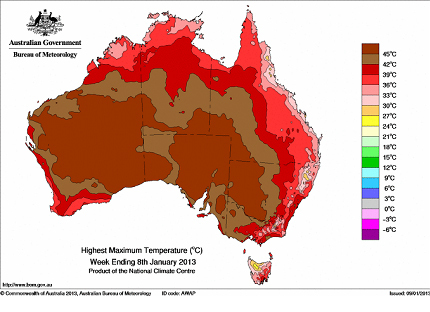 I can´t find this map in Australia's weather service site. Then proceed to their tables of extreme heat, we also learn that it has been very warm in many places, over 48 degrees, phew! But now the temperature has dropped somewhat luckily. But how has it been previously? 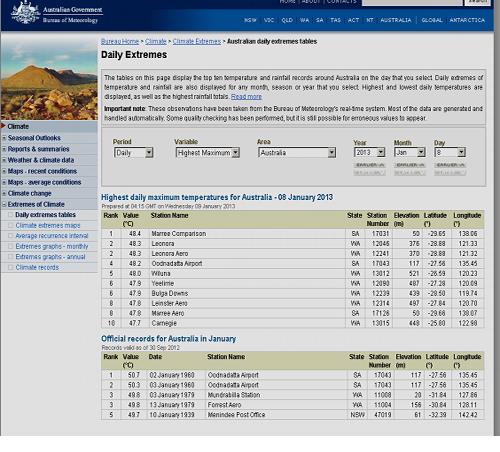 Suspicions confirmed, Australia is a land of temperature extremes. ABNORMAL HEAT. NEW SOUTH WALES AND QUEENSAND. 123 degrees F = 50.55 degrees C This was already 1903.